G.W. 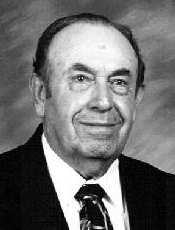 Sneed, 87, of Winters, passed from this life on Sunday morning June 1, 2014 in Abilene Regional Medical Center. G.W. was born to J.A. and Dovie Sneed on June 6, 1926 in Lafayette Springs, Mississippi. Soon after the family moved to Texas and settled in the Grass Burr Community. G.W. Married Gladys Reid May 20, 1944 in Winters and lived in Bradshaw and later moved to Winters. G.W. served the agriculture community for over 40 years by managing Mansell Brothers John Deere Dealership in Winters and later owned Sneed's Agri-Supply. G.W. and Gladys raised 2 sons in a loving, Christian home. G.W. was a longtime member of the First Baptist Church of Winters and loved his Sunday School class. G.W. is survived by: 1 son, Terry Sneed and wife Princy of Winters. Granddaughter Shara Robertson and husband Andrew, great-grandchildren, Samuel and Holly Robertson all of Roundrock, Texas. 1 sister: Ann Harms of Abilene and many nieces, nephews and a host of Friends. He is also survived by a special friend: Betty John Burns of Winters. G.W. was preceded in death by his wife Gladys, son Gerald Wayne (Jerry) Sneed, daughter-in-law Susan Sneed and grandson Shannon Sneed. He was also preceded by 3 brothers and 1 sister: S.B. Sneed, Russell Sneed, Kenneth Sneed and Nona Gill. The family gives many thanks to the wonderful doctors, nurses and staff of North Runnels Hospital, Abilene Regional Medical Center and Integracare Hospice. Services will be 10:30 A.M. Wednesday June 4, 2014 at the First Baptist Church. Burial will following at Lakeview cemetery directed by Winters Funeral Home. The family will receive friends at the funeral home from 6:30 P.M. to 7:30 P.M Tuesday June 3, 2014 at Winters Funeral Home. The family request that in lieu of flowers memorials be made to a favorite charity.